NASA's Mars Exploration Rover Opportunity recently investigated this polygonally fractured rock called "Escher," located on the southwestern slope of "Endurance Crater." Almost by accident, NASA'sMars rover Opportunity has found a rock that may point to a second water eventin the red planet's past. The rover was backing awayfrom potentially treacherous, sandy terrain at the bottom of Endurance Craterwhen its cameras came across "Escher," an oddly cracked rock thatresearchers said may have fractured after being soaked during some sort ofwater event. But more evidence is neededto be sure. "There may have beensome frost, some water present, but it's not a definite result," saidSteve Squyres, the rover mission's principal investigator, adding that somefollow up observations at a rock called "Wopmay" may shed more light. "Our hope is that it will reveal more to us about the possibility of asecondary water episode." If verified, it would pointto a secondary water episode that occurred after Endurance Crater formedon the plains of Meridiani Planum, Opportunity's landing site. The robust rover hasalready found evidence indicating the region was initiallysoaked in the distant past, prior to the crater's formation, Squyres said. Squyres and other missionscientists discussed the current progress of Opportunity and its robotic twinSpirit during an Oct. 7 teleconference that connected researchers from CornellUniversity, Massachusetts Institute of Technology (MIT) and NASA's JetPropulsion Laboratory (JPL) in Pasadena, California. The tantalizing prospectpopped up when Opportunity found "Escher" cracked and fractured intopolygonal shapes. On Earth, such polygonal rock patterns have been known to beassociated with water, but they could just as well have formed when an impactsmacked into the surface elsewhere on Meridiani Planum, researchers said. "As the [Earth] rockdries out, it reduces its volume and contracts in all directions,"explained John Grotzinger, a rover science team member from the MIT. "Thisis not to say these [Mars formations] aren't tectonic, but we have to considerthis water option as well." 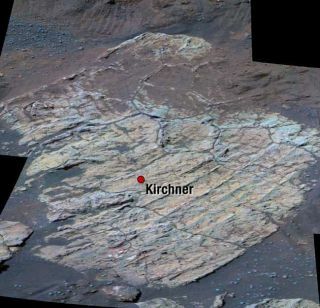 Opportunity drilled into"Escher's" surface with its arm-mounted rock abrasion tool (RAT),finding the chemistry of its innards substantially different from its surface.While that hints at a possible past interaction with water, "Escher"is the first Martian rock in which the polygonal patterns have been found andits flat orientation on the floor of Endurance Crater poses a limited view intothe rock's history. Wopmay, which researcherssaid shows some similarities with Escher, stands upright on the Martian surfaceand could answer questions its predecessor leaves outstanding. "If you're going toreach a conclusion for water, you're going to need all the data," Squyressaid. Opportunity is not alone inmaking new discoveries. Sitting atop the West Spurof the Columbia Hills in its Gusev Crater landing site, Spirit overcame arecent steering problem to study the nearby rock"Ebenezer," which appears to reinforce views that water once soakedthe hilly region, researchers said. "We're beginning tosuspect that almost all of the rocks in Columbia Hills look like this,"Squyres said, adding that while "Ebenezer" differs in outwardappearance from other nearby rocks, their chemical signatures all indicate pastinteractions with water. Meanwhile, Spirit'spanoramic camera snapped a new vista dubbed Cahokia from its West Spur perch,which includes a clear, 50-mile (80-kilometer) view to the very edge of GusevCrater. "It's a spectacularview," said Jim Bill, rover lead scientist for panoramic cameras atCornell University, adding that the image was taken over 10 Martian days - orsols - and relayed to Earth over a period of weeks. Rover engineers are stilltrying to understand the exact nature of Spirit's steering glitch, whichapparently cleared up on its own. While Spirit is again mobile, engineers hopeto prepare a plan to handle the problem should it occur again. "We don't have a rootcause for this event yet but as they age we'll see more aches and pains,"said Jim Erickson, rover project manager at JPL. "We'll just have to dealwith the problems as they go." Next up for Spirit is thesummit of nearby Husband Hill, while Opportunity will complete its Wopmaystudies and finally head to the rock outcrop of Burns Cliff on the rim ofEndurance Crater. "We've got a lot ofgood stuff ahead of us," Squyres said.